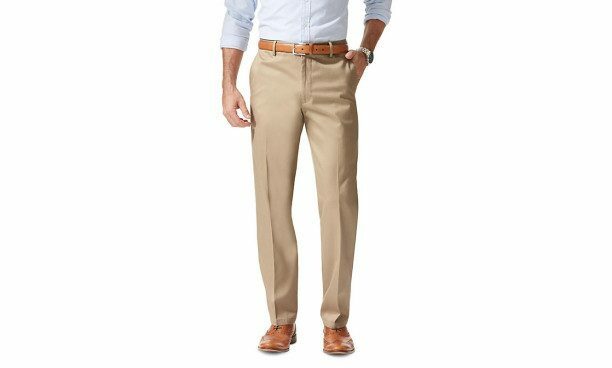 Wrinkle-Free, Straight Fit Dockers Only $11.99! (Reg. $58) Ships FREE! You are here: Home / Great Deals / Wrinkle-Free, Straight Fit Dockers Only $11.99! (Reg. $58) Ships FREE! Order 5 pairs of Wrinkle-Free, Straight Fit Dockers for Only $11.99 each! (Reg. $58) Plus get FREE shipping! Use promo code THREE4ALL at checkout to get an additional 40% off the sale price of $19.99. Buying 5 pairs gets you over the FREE shipping limit! Win-Win! Manage your professional style in total comfort with our innovative No Wrinkle® Refined Khaki in a straight fit. Straight through the hip, thigh and leg with No Wrinkle® fabric for easy care, you will be looking sharp throughout the day. Features dark blue internal binding and white internal pocketing.